Toileting is an activity that all of us have to engage in on a daily basis in order to eliminate waste from our bodies. As we age, we are likely to experience decline in strength and our ability to maintain balance or standing endurance. On top of this, not all bathrooms are constructed to be senior friendly or accessible for those with those with physical limitations. For this reason, standing from a sitting position on the toilet is one of the most common challenges experienced by seniors and those with physical disabilities. Let’s review the difficulties people have with toilet transfers and strategies to overcome these challenges. Pulling on a tubrail to try and stand from a toilet can lead to falls or injury. There are better and more secure bathroom aids that can be utilized. Relying on near nearby counters or cabinets for support to get into standing – these items are not secure enough to bare one’s weight and have poor hand grips to ensure a steady grasp. For instance, pulling on cabinetry can lead the entire shelf and its contents falling on you. Tugging on a nearby tubrail that is clamped onto the bathtub edge to help get into standing. Over time this may loosen the rail, dislodge it and can potentially lead to a fall. Holding onto the bathtub edge for support. Once again, this is not considered a good grasping surface, especially if it is wet. Pulling on nearby towel racks to get into standing. These are not well secured into the wall. Using it may yank it out of the wall or it might even break in half at the point where one is pulling. Can lead to a fall. They are called towel racks for a reason and should only be used to hold a towel. Incorrect walker usage to support toilet transfers. Pulling on the handles to help get into standing only places one at risk of falls. Narrow doorways or small bathrooms act as a barrier to using a mobility aid within the bathroom. 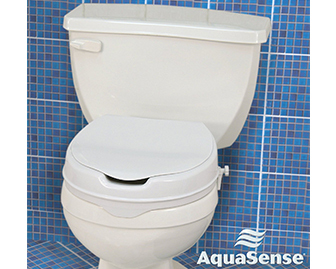 A raised toilet seat can make the toilet taller and easier to stand from. 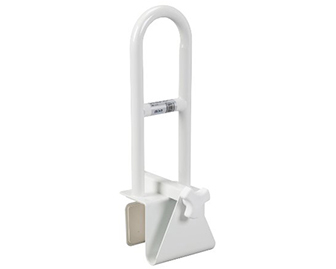 Toilet safety rails allows one to push off the arms to gather the momentum to stand. Bathroom commode – sits inside the toilet bowl. It adds some height to a low toilet seat, and also has arms that can be pushed on to get into standing. Grab bars – installed into studs of a nearby wall that can be used to push on or pull on to help one with getting into standing. Rollator walker – not considered a true transfer aid, however it can be used to improve stability during transfer attempts. 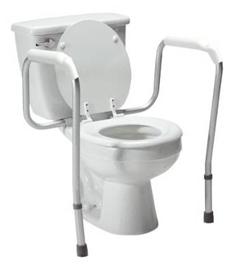 Push off the toilet seat with one hand while stabilizing oneself with the other hand on the walker. Note that brakes must be locked prior to transfers. Sliding transfer board – can only be used by wheelchair users that have a toilet seat that is similar in height to their wheelchair seat. Minimizes the need to get up during transfers as one can simply slide along the board from the toilet to the wheelchair and vice versa. One common barrier to bathroom safety is the usable door width. Many homes have narrow bathroom doorways, which can prevent walkers and wheelchairs from entering. These mobility aids are usually left in the hallway and the person is at risk of falling as they enter the bathroom with little to no support. This can potentially be corrected by either removing the door itself or using offset hinges. This increases the usable width of the door as the door no longer sits within the frame and partially obstructs the opening. However, this may not always be enough or it is not practical to eliminate the door for privacy reasons. As one ages our bodies start to deteriorate and lose the strength and endurance they once had. This is especially true for those that experience deconditioning following a hospital admission, injury or acute illness. Participating in occupational therapy or physiotherapy, either in the community or within a rehab setting, allows one to return to their previous abilities or an optimal level within their limitations. These healthcare professionals can design progressive strength, balance, and endurance building exercise programs to help maintain or improve independence. More importantly these therapists are trained in home safety and can make recommendations on which of the above assistive aids should be used by an individual to help with toilet transfers. They will assess the individual’s capabilities and make appropriate recommendations that match one’s abilities. Whenever one has challenges with toilet transfers, it is possible that are other tasks or activities within the home that are also difficult to perform. Having a home safety consultation can uncover some of these challenges and suggestions can be made to improve one’s functioning. In essence, these healthcare providers optimize one’s living circumstances to allow one to age safely at home and decrease the need for a nursing home admission.